The Dining Philosopher: ARE YOU KIDDING ME?!?!?! Alright alright, I apologize in advance about this digression from my technical postings but this was just toooo good to be true. Ok Mabel, it's not an urban legend anymore!! I done seen it with my own eyes. Session - Cloud Computing, Show Me The Money. Amazon, Google, Intuit, Microsoft and some other unlucky SOB are giving their cloud computing demo for the session. Each speaker was alloted 5 minutes max to demo their app and I have to admit some of these were really cool. The first one was the capturing of San Francisco traffic maps, analyzing the data obtained from these and putting it into the cloud for everyone to use. Cool if you live in San Francisco but useless in New York. The next demo consisted of a very simple 'hello world' servlet app written, compiled and uploaded to the cloud right in front of us. Quite easy and cool. Could we have had a litle more than 5 minutes please!! Intuit was next with a similar easily deployable application. Sorry, but for the life of me I can't remember what the app did (that was impressive). Then it was Microsoft's turn. I kinda felt sorry for the presenter when he clicked go... you could audibly hear him say 'pleeeease, don't do this to me!' Well, on second thought, maybe I didn't, he makes a lot more money than I do and, yes, sometimes my code doesn't work either but it does when it HAS to. I hope the girl sitting next to me enjoys this post because she said she would definitely check it out. Sorry it took until Sunday but ya gotta admit it was worth the gloat... I mean wait (I really liked your EEEPC). Next time back to the technical stuff (gloat, guffaw and I'll be damned, it's not just an urban legend). I'll definitely check back regularly to your blog for more Java fun/technical stuff. Let me know how the Ubuntu install goes. Hopefully not too many pain points. Lisa get back to me! I'm looking at the Asus 1005HA. It only comes with XP and I want Ubuntu. I need to know if you ever went to Linux and what were the pain points. Looking forward to talking with you about this. Hey John -- Unfortunately, I still haven't had a chance to do the Ubuntu port, so I won't be much help. However, you can probably get a lot of information here: eeeBuntu Forum. They just released eeeBuntu 3.0 (which I will be installing once I get some time), and I'm sure you can find any problems people have had on the forum. eeeBuntu can be downloaded here. Sorry I can't be more help -- maybe I'll end up asking you about your Linux experiences! Hey John, eeePC girl again. 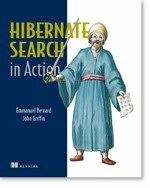 I've been Googling around for tips related to modifying Lucene to suit my needs, and your book has come up a few times in my search results. So, I thought I'd say 'hi' again! Did you ever buy the Asus and install Ubuntu? I haven't done anything with my netbook, but I'm seriously considering blowing away Windows on my full-size laptop since it's been buggy lately.